To say the new doubles team of Vasek Pospisil and Jack Sock has had a good July would be a bit of an understatement. The Canadian/American duo started out the month by defeating the greatest doubles team of all-time, the Bryan brothers, on the biggest tennis stage in the world, Wimbledon, in five long sets. Now they closed out the month by taking the 2014 BB&T Atlanta Open title by defeating the American pair of Steve Johnson and Sam Querrey, 6-3, 5-7,10-5. Atlanta doubles fans appreciated the high quality of play in 95-degree heat. But what was special about this match was that each participant is also a singles player, ranked in the top 75 in the world. After winning with first set by converting two break points, Pospisil and Sock went up a break in the second as Sock hit a half-volley topspin lob over the head of Johnson that landed just inside the baseline. A match tiebreak would decide the winner and it was Pospisil and Sock that would jump out to a 4-1 lead on the strength of their first serves. Johnson tried to pick up his partner when he angled a drop volley from below the net for an outright winner. Pospisil and Sock held their serve points and Querrey double faulted on match point to hand the Wimbledon champions another title. The pair will team up next in Toronto, and follow that by playing in Cincinnati and the US Open. 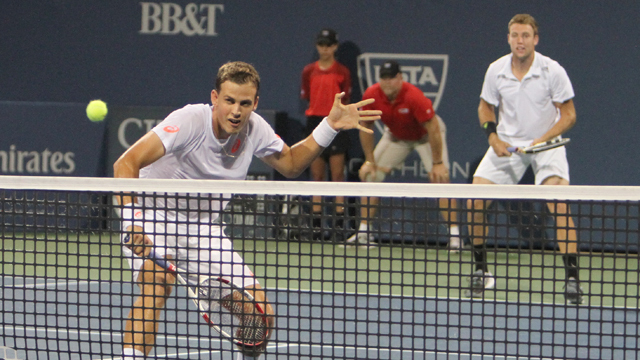 Pospisil and Sock split the winner’s share of $31,320.